10 years offering specimens on line! For our 10th anniversary we prepared this new card label that we have designed exclusively for all the specimens worth over 100 Euros that are bought from our Internet site. 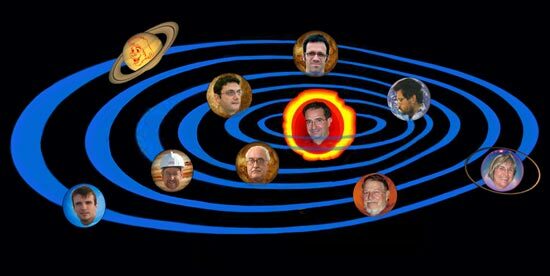 This is the "planetarium" for Fabre Minerals, if you click on a 'planet' you will find a short text describing the relationship of each the 'planets' with Jordi and Fabre Minerals. No meteorite crashes, don't worry! We have created a discussion forum where people can air their views. Feel very free to contribute and share your thoughts, and also see what other people are saying. You can visit it by clicking on this text or on the image. 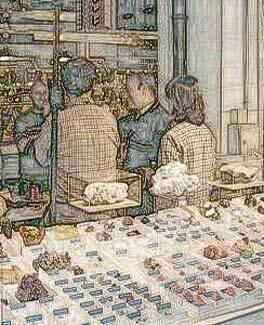 In the May-June 2006 issue of the US magazine Mineralogical Record, there was an article in which four different people (I wrote one of the position papers) discussed mineral sales over the web, both the advantages and some possible disadvantages. We would like that the discussion generated by this article continues, so we are publishing here the article. You can view it by clicking on this text or on the image.